Talkase Black iPhone 6 is a mini credit sized mobile phone that can be attached to your iPhone 6 or 6S and connected to your Apple device via Bluetooth. This GSM mini phone works as a standalone phone to make and receive calls and SMS. Simply insert any micro-SIM card into the Talkase Black phone to make phone calls or SMS anywhere at any time. Talkase Black iPhone 6 can also connect to your iPhone 6 or 6S via Bluetooth to make and receive calls on your mini phone Talkase and synchronize your incoming calls, contacts list, call list, music, etc. The Bluetooth connection enables you to answer calls on the Talkase phone when your iPhone rings. Talkase Black iPhone 6 is equipped with a personalized cover to protect your iPhone 6 or 6S and fix the mini mobile on the back of your smartphone. In addition, this case allows you to carry 1 extra SIM card, 1 SIM PIN removal tool and your credit card. This mini credit card sized mobile phone is very useful for traveling businessman, students, children, outdoor activities, etc or anyone who carry more than one SIM card or several devices to be sure they have one mobile ready to work at any time. 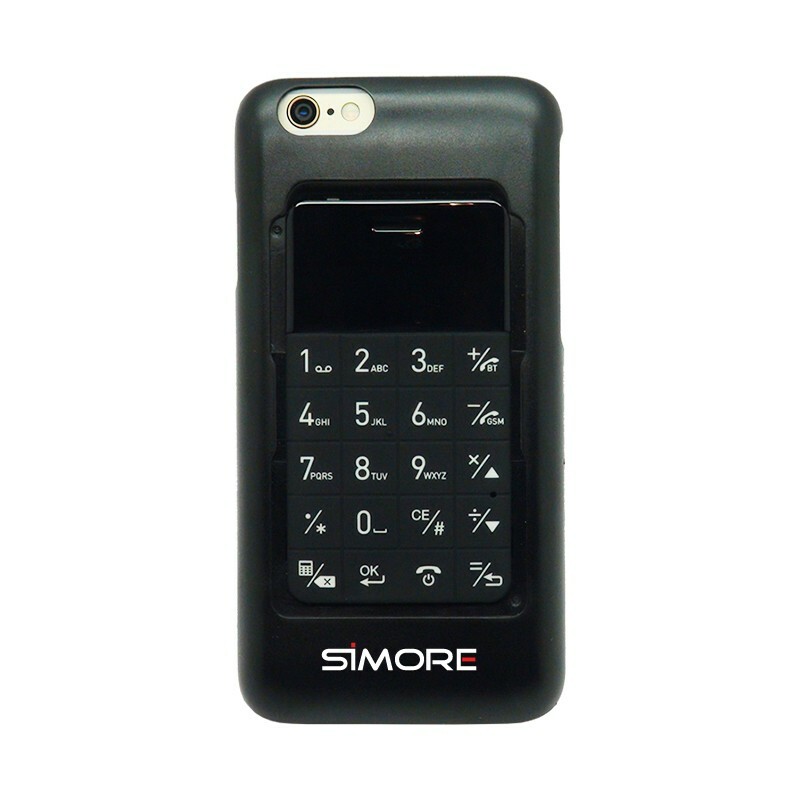 Super slim and mini sized GSM mobile phone. Allows to make and receive calls and SMS. Connects to your iPhone 6 or 6S to answer calls, sync your contacts, call list and music. Attaches to your iPhone 6 or 6S thanks to the specially-designed case. Do I need to jailbreak my iPhone to use the mini phone case Talkase ? No, the mini phone case Talkase doesn't require the jailbreak of your iPhone. Can I receive calls and SMS simultaneously on my 2 SIM cards with both iPhone and Talkase ? Yes, Talkase is a mini cellphone with case clippable on your iPhone which allows to send and receive calls and SMS at the same time on both SIM cards. Can I use all SIM cards sizes with the mini phone Talkase ? The SIM slot size of the mini cell phone Talkase is micro SIM format. Can I use any mobile phone provider with Talkase ? The mini phone Talkase is free from any provider (unsimlocked) and can be used with all GSM mobile phone operators. How do I connect Talkase to my iPhone ? Simply activate the Bluetooth function on your two devices to connect them. What is the battery life of the mini phone Talkase ? The battery life is 3 to 5 hours of talk time and 72 to 120 hours of standby time.